Particleboard is the standard wood core for Hartson-kennedy laminate countertops. On any given day, saw mills and other wood processing factories generate a significant amount of manufacturing by-product and scrap material. Much of these wood shavings and piles of sawdust are recycled and end up as an engineered wood product called particleboard. Particleboard is a value-packed alternative to solid wood paneling or boards. It is primarily intended for interior projects in which size consistency, smooth surfaces, and a homogeneous construction are a priority. Examine a section of particleboard and you’ll most likely notice a lack of grain. Particleboard is produced by combining sawdust and other wood scrap with a special resin. This slurry of wood chips and glue is then pressed through an extrusion machine to form long sheets of particleboard. Customized saws cut these sheets into various sizes according to the needs of the customer. Countertop manufacturers use particleboard in a variety of sizes, but generally ¾” thick panels in 30″ widths in 8’, 10’ and 12’ lengths are most suitable for countertop cores. Although unfinished particleboard bears little resemblance to traditional hardwoods, its smooth, consistent surface is ideal for lamination. 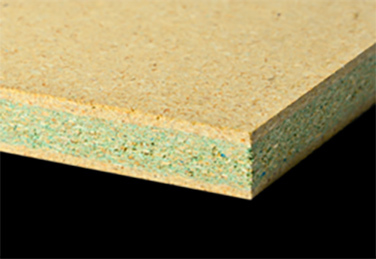 One of the things conventional particleboard cannot handle, however, is high exposure to moisture. This is why few if any outdoor projects feature particleboard. Direct and/or prolonged contact with water can cause particleboard to stain, warp or swell. 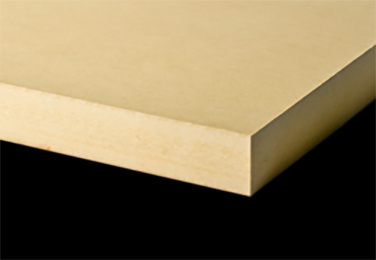 Moisture resistant (MR) type particleboard performs much better in higher moisture applications. NAUF MR Particleboard is made of recycled or recovered wood fiber particleboard engineered to meet today’s green building requirements. It is produced with an ultra-low emitting formaldehyde resin system. It is also moisture resistant and meets the moisture resistant specification for category MR10 with a 5.5% maximum thickness swell, demonstrating enhanced dimensional stability in high humidity environments. These attributes make it an ideal substrate for countertops. 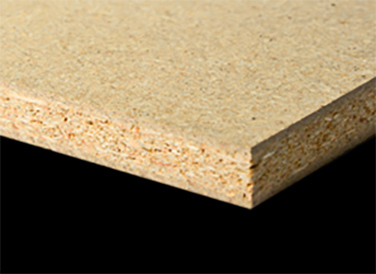 Medium density fiberboard, or MDF, is a composite wood product similar to particleboard. It’s made out of wood waste fibers glued together with resin, heat, and pressure. MDF is appropriate for many applications, from cabinetry to molding and is great for countertops because it is smooth uniform, and less prone to warping. MDF has many advantages over plywood, particleboard, or high-density fiberboard. It’s very smooth because the wood fibers used in its manufacture are uniform and fine. This makes it have low “tear out,” which means that when sawed, the end has a smooth cut instead of a more jagged edge. MDF panels machine very well with carbide tooling and have smooth profiles after the shaping process. MDF also has a mild reaction to moisture, meaning it is less prone to warping or swelling in high-humidity applications like a kitchen or bathroom environment. Builders and fabricators use MDF in many capacities, such as laminate countertops, furniture, shelving, laminate flooring, decorative molding, and doors. They value MDF for its insular qualities in sound and heat. Also, it can be nailed, glued, screwed, stapled, or attached with dowels, making it a truly versatile core material. Reconstituted, engineered wood products like MDF are often covered with a laminate or veneer sheet. Some people prefer using MDF over regular plywood or lumber products because it has a lower impact on the environment. MDF is solely made from waste products, the leftover scraps that would otherwise be dumped in a landfill. This attraction has helped it gain popularity among homeowners. 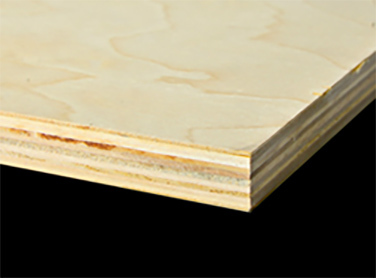 Plywood is a wood product manufactured out of many sheets of veneer, or plies, pressed together and glued, with their grains going in opposite directions. Plywood tends to be extremely strong and is treated in many different ways depending upon its intended application. Because of the way in which plywood is constructed, it also resists cracking, bending, warping, and shrinkage–depending upon its thickness. Plywood is also referred to as an engineered wood, although it is made from a composite of wooden materials, and various forms of it have been made for thousands of years. The plies that form plywood are generally cut on a rotary lathe, which cuts a continuous roll of wood while a log, called a peeler, is turned against it. Rotary lathing is rapid and makes efficient use of the wood while turning out veneers highly suitable for plywood. Rotary lathe veneers tend to be dull in appearance, although perfectly functional for use as a countertop core. After the veneers are cut, they are overlaid with layers of glue and pressed together until dry to form a flat, even, tight piece of plywood. Plywood is sturdier than regular sheets or panels of wood because the veneers are laid with their grains opposing, which also causes the wood product to resist warping because the grains pull each other tight. Plywood comes in a number of forms, including softwood plywood, which is made from pine, fir, or spruce. Softwood plywood is usually pale in color and is used in construction applications. Plywood can also be decorative, with a facing veneer of exotic hardwoods. Mahogany or birch is used to create an extremely strong type of plywood known as aircraft plywood, because it was utilized in the construction of aircraft through the Second World War. When plywood is destined for use as a countertop core in an indoor application, it is made with urea-formaldehyde glue, which dries quickly and is a good value. For plywood intended for use in outdoor applications or wet environments, a more expensive water resistant glue is used to prevent the plies from coming apart, or delaminating, and compromising the strength of the plywood. Plies range in thickness depending upon the plywood panels they are used in, from 1/10 inch (approximately 1/5 centimeter) to 1/6 inch (almost 1/5 centimeters). Standard plywood sizes consist of four foot by eight foot (1.2 by 2.4 meter) sheets in three, five, or seven plies. Plywood intended for countertop applications is normally manufactured in a ¾” thickness (23/32″), features 7-ply construction, and comes in 30″ by 8’, 10’ and 12’ lengths. Plywood cores for countertop construction are sometimes a specification requirement for HUD installations.